With peak earning years typically arriving at a young age and a career path that is difficult to predict for a multitude of reasons; the reality is that, as a sportsperson, you are faced with complex and often unique financial challenges. Whist a fortunate few reach the pinnacle of their respective field – and enjoying the financial success that comes with that – a large proportion see both career and earnings potential, drop off before ever really getting started. This uncertainty is further complicated by fact that sport, as a profession, has a short earning window. So even for those fortunate to enjoy a long and successful career, a time span of 20 years is likely to be the limits. The Professional Footballers’ Association (PFA) states that the average career in football is actually just 8 years. In the US, the average NFL career is less than 4 years. If you are lucky enough to enjoy a successful career as a sportsperson, then as you arrive at the end of your career around the age of 35 (this could be later for certain athletes; such as golfers for example), life expectancy data suggests you will have a period of around 50 years of retirement! Whilst a select few may succeed in securing high paying careers in other professions, such as sports coaching/management or jobs within the media; for the majority, with the end of their sports career will come the end of their high earning capacity. It should come as no surprise then, that a worryingly high number will eventually fall on hard times – suffering serious financial problems. Sporting charity, Xpro, claims that as many as two in five (40%) Premier League footballers face bankruptcy within five years of retiring from the game. This is certainly not a foreboding reserved for the exclusive domain of Premier League footballers. Across the Atlantic studies have produced even more damning statistics: In a 2009 study, Sports Illustrated found that just 3 years following retirement, 78% of NFL players faced financial stress or worse or had even gone bankrupt. A later study by the National Bureau of Economic Research, published in April 2015, found that nearly 16% of former NFL players file for bankruptcy within 12 years of retirement. One of the starkest examples, illustrating how no amount of money is a guarantee of future security, can be found in boxing legend Mike Tyson: Whilst Tyson is known to have earned more than £250 million over his boxing career, he also spent extravagantly on mansions, luxury cars and even pet tigers! Tyson is reported to have owed £5 million in his divorce settlement and £8.5 millions in taxes to the Inland Revenue Service. At the time of filing for bankruptcy in 2003, he claimed debts of £17 million. Whether a young sportsperson in receipt of your first professional contract or a seasoned pro with a cabinet full of trophies and a bank balance to match; you may be finding it difficult to conceptualize how this could happen to you? Ultimately, a sportsperson is like any other young individual – in the sense that when you start your career, it is not common to have any experience or education in areas such as budgeting, the tax system or long-term financial planning concepts. From such a starting point, then in it is easy to see how things can go wrong – especially over the longer-term – if good quality advice is not forthcoming. Anyone in life can find themselves blinded by their own success and money: the easy trap to fall into is buying into an extravagant lifestyle without any understanding of whether you can maintain it or not. The danger of this happening to a sportsperson is just much higher; as a consequence of receiving huge sums of cash at a young age and with such limited life experience. The problem can often be worse when you reach the end of your career, when income has greatly reduced but your spending continues at the same (or a similar) level. Most clients are very surprised to learn just how quickly they could run out of money when we illustrate this to them through the use of lifetime cash flow modelling. As a successful individual in a high earning profession, it is easy to become a target of people looking to exploit this for their own benefit. One common issue over the years has been the lure of investment schemes which appear to be ‘too good to be true’. These are often a significant factor in a sportsperson losing their wealth. There have been many reports in recent years with accounts of how sportspersons and celebrities have landed themselves huge tax bills from HMRC, for being enticed into ‘specialist’ investments offering generous tax rebates – such as film investment schemes, to name but one type. These are often unregulated schemes and/or sold by people who are not qualified to do so. The consequences can be disastrous: you would be well advised to steer very clear of such schemes. As a sportsperson, you may find that – often for reasons of time or ‘knowing who to trust’, you become reliant on advice from friends and family. Through a lack of structured and specialist knowledge, this can easily lead to unbalanced portfolios – such as an over-allocation to property for example. Perhaps you rely on advice from your relationship with an agent? However, whilst your agent might have the best intentions at heart, the reality is that often they are not professionally qualified in the areas of financial planning or other matters, such as taxation. It is not uncommon for third parties, such as agents, to be receiving an introduction fee as a financial incentive. Whilst in isolation, this does not automatically translate to bad advice, this can result in a conflict of interest. The charity XPRO, says some 33 percent of football players get divorced within a year of retiring. A divorce dissipates assets and can drain funds in legal fees. Whilst nobody makes plans to get divorced as part of their marriage nuptials, if you find yourself in this situation, then it is not uncommon to end up with your wealth halved and then still having to face the burden of large alimony and child support payments. Even if you are lucky enough to avoid the first four of our five main ‘wealth destroyers’: the simple fact that you will most likely spend an extraordinarily long period of time ‘retired’, will by itself, put you at high risk of financial stress at some point in the future.. The current age from which an individual can draw a pension in the UK is 55; this will increase to age 57 in 2028. According to the Office for National Statistics (ONS): life expectancy is currently around 81 years for a male and 84 years for a female. 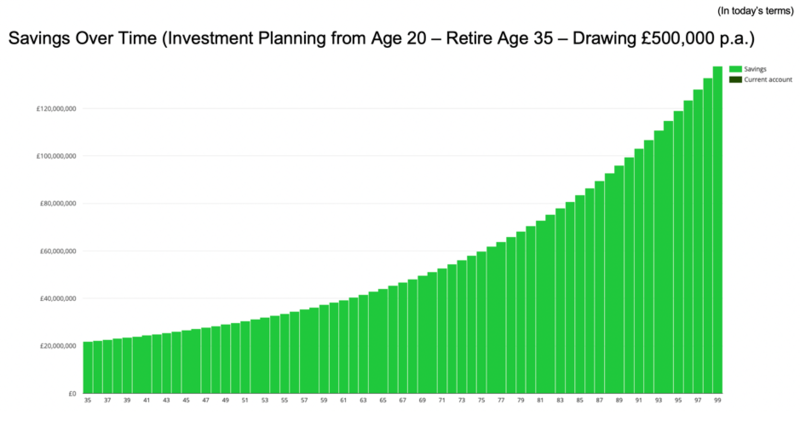 So, anyone working in a ‘normal’ profession that takes early retirement at age 55, would need their funds to last around 26-29 years or more. If we consider that the average sportsperson will retire at 35 (earnings may continue, but for many, a very significant drop off occurs), then your accumulated wealth will need to you last somewhere approaching 50 years or more! Cash Flow Analysis: How long will your money last? Below we have produced some simple lifetime cash flow examples. To ensure the numbers keep a sense of perspective, we have applied a 2.5% rate of inflation to each illustration. This means that when we look at a value in 10,20 or even 50 years’ time, we have a ‘real terms’ value of how much this is worth in today’s money – rather than some difficult to comprehend and vastly inflated future value. 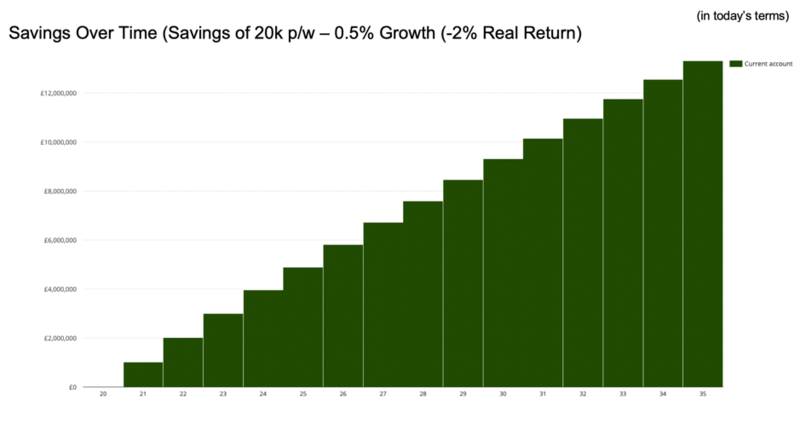 The potential benefits of compounding investment returns. For this reason, complexities such as taxation or variance of incomes and expenditures are ignored. 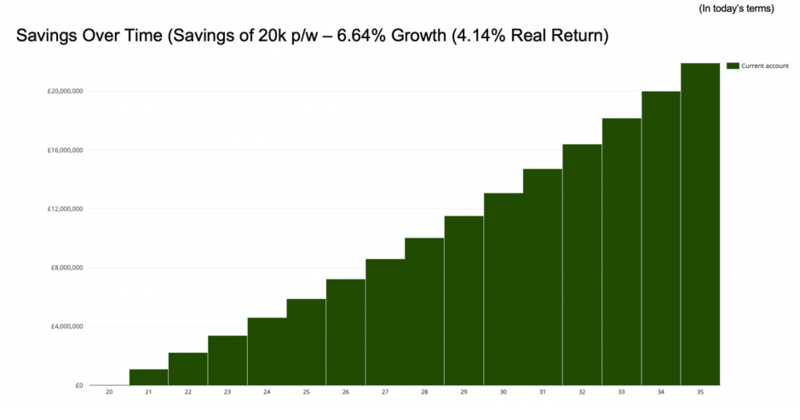 In reality, when we produce lifetime cash flow modelling for an actual client, this will be highly personalised and consider all of the above. From the examples below, it is evidently clear that even for those fortunate to have accumulated vast sums of wealth, it is actually far easier to run out of money too early than most would care to realise. 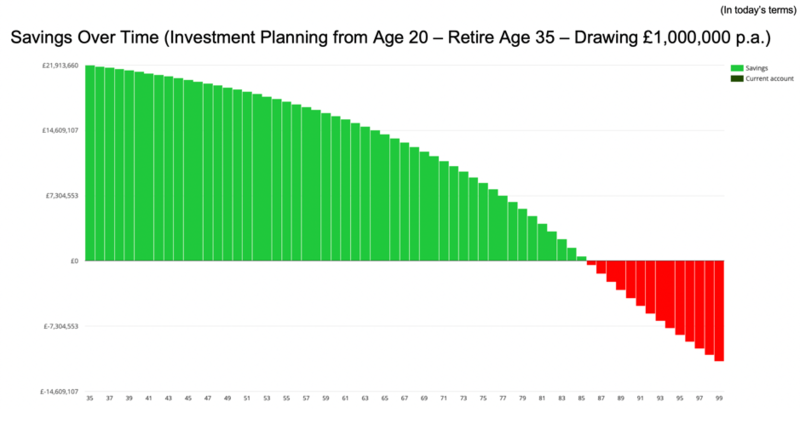 The speed at which this happens will be accelerated when spending is maintained at pre-retirement levels or when poor investment decisions are taken. When combined the results can be both rapid and catastrophic! This assumes our sportsperson saves £20,000 per week from age 20 to 35. The money is held in a low interest deposit account earning 0.5% per year. This shows that our sportsperson has accumulated career savings of £13,322,519 (inflation adjusted – so in today’s purchasing power terms) by the time they retire at age 35. At first glance, that looks like a very satisfying pot of savings! But what if the sportsperson had instead invested the same £20,000 per week into a diversified portfolio of investments? Below we have assumed our sportsperson invested their money into a ‘highest medium’ risk portfolio of diversified and highly regulated collective investment funds; which based on the current suggested asset allocation is expected to return 6.64% growth per annum; that’s 4.14% per annum growth in ‘real terms’ when adjusted for the inflation we have assumed. With the benefits of compounding returns over their career, our sportsperson has managed to accumulate a significantly higher pot of £21,913,660 to enjoy for their retirement years. That’s potentially an additional £8,591,141 (64%) just from following a structured investment plan. But what about the retirement years? Here we assume our sportsperson continues to enjoy a luxury lifestyle once retired and annual spending is £500,000 – this is maintained indefinitely and in real terms (i.e. increases in line with 2.5% inflation). Let’s start with our first example: which is based on having no investment plan and depositing the money into a low interest bank account. Although our sportsperson started with a healthy pot of savings worth £13,322,519, unfortunately his £500,000 a year lifestyle was unsustainable and by just age 56 was out of money. Coincidentally, this is around the earliest age at which most people in ‘normal’ careers have the option of retiring through accessing their pensions – which is age 55, increasing to 57 in 2028. 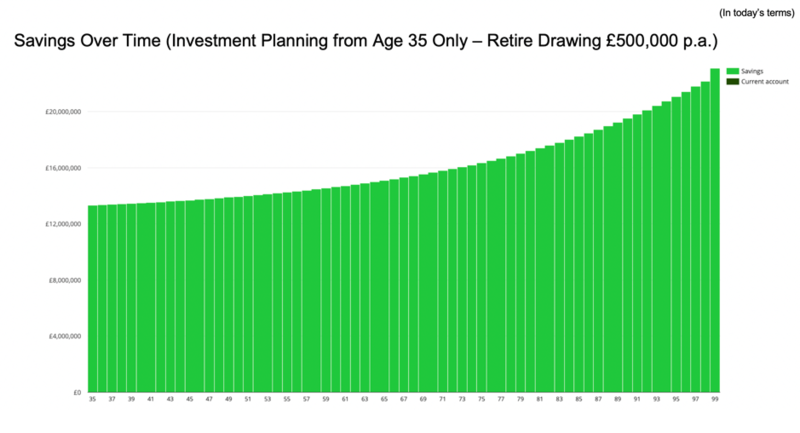 By contrast, what if our Sportsperson had sought professional financial planning advice when retiring at 35, and instead invested the £13,322,519 into our diversified portfolio? The good news is that this will produce a completely different outcome: Their lifestyle remains fully affordable; and even better: they continue to increase the value of their money in real terms; and so on their death at age 85 leave a pot of £18,476,361 for their loved ones. Good advice from the outset..
Whilst the above example clearly illustrates the value good advice could provide for a sportsperson if received when ending their careers; what about if we look at what value could be added if our sportsperson had instead been investing from the very start of their career? The difference is staggering: When our sportsperson dies, assumed at age 85, they leave behind a pot of £86,482,338. Equally, if bequeathing vast sums of money on death is not the main priority – and let’s face it: £86 million is probably a bit too much for any sized family (without effective estate planning most would end up lost to HRMC in Inheritance Taxes anyway) – then the investment planning could instead be used to provide for a more free-spending life. 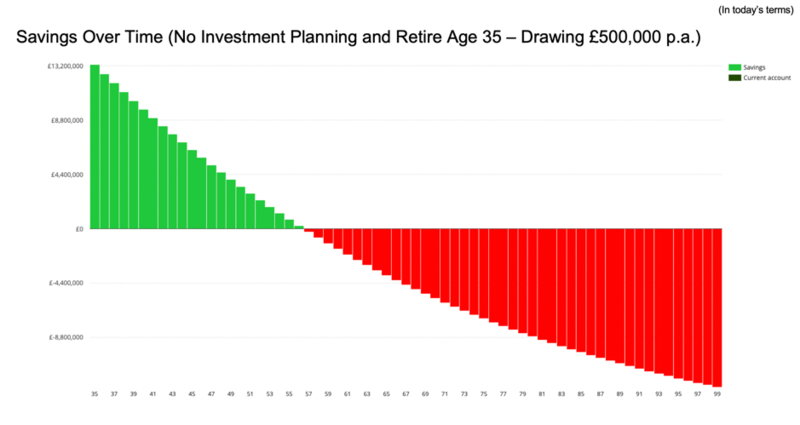 In the final example below, we can see that if our sportsperson had been following an investment plan from day one and continued to do so: this would allow for £1,000,000 per annum of drawings – with the funds eventually running out at age 85 (conveniently, this pretty much in line with life expectancy). 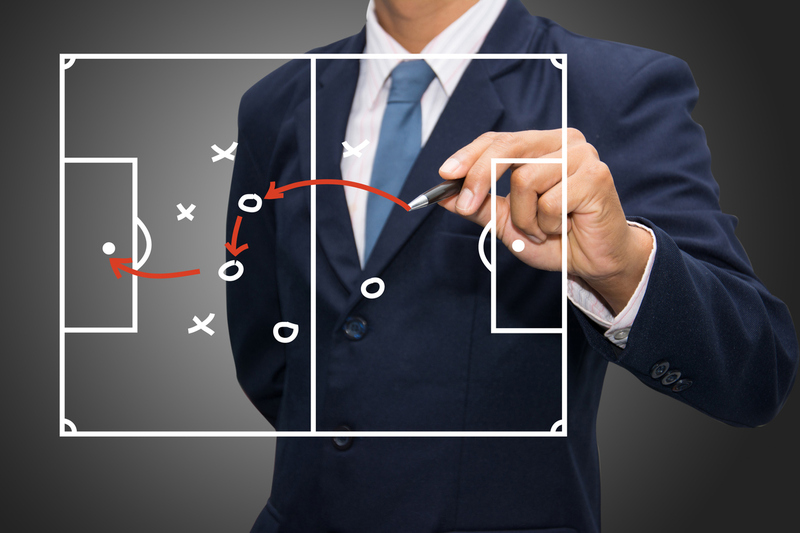 As experienced Chartered Financial Planners, we are able to use our wealth of experience and broad skill set to help sportspersons on the most effective structuring and management of their financial affairs. We will provide you with high quality advice, tailored to your specific needs, and which is delivered in a language you can easily understand. We combine this with a first-class service; all of which ensures you can keep your focus exactly where it needs to be and staying on top of your game. In an increasingly unpredictable and competitive environment, knowing your financial future is secure for both you and your family, should be of the highest priority. Contact us today to learn how we can help.